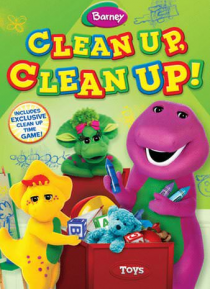 IHG® Rewards Club - Movies - Barney: Clean Up, Clean Up! Cleaning up has never been so much fun! Barney shows his friends a tee-rific time as they paint the caboose, wash windows, pick up litter and put away toys! BJ and Baby Bop show Riff all the fun ways to clean up the park when his litterbot - a trash collecting robot - malfunctions. All the friends pitch in to clean up spilled paint when BJ makes a mistake, and everyone works together to set up - a… nd put away - a fancy tea party.